The South Carolina Green Party endorses the Rally For A Moral Budget 1:00 PM, Saturday, March 12 at the South Carolina State House. The rally is not accepting formal sponsorships by any political party. This nonpartisan event, drawing together South Carolina religious organizations, labor unions, public workers and civic organizations will demonstrate our support for a SC budget that preserves and protects the interests of the people. Join the emergency call for a moral budget in South Carolina. 1PM March 12 at the State House. Speakers will present the moral arguments for resisting cuts, as well as highlighting proposals to reform the state government, tax structure, and budget process. It is especially important to share information and meet when desperate cuts are being planned as though there were no alternatives. The South Carolina legislature cannot be permitted to balance the budget through regressive taxation while favoring non-essential programs like school vouchers. The cuts proposed by both the SC state and US federal government will severely impact the poor and middle class. Salary cuts and layoffs of public workers will surely further depress the SC economy. Workers in Wisconsin are threatened with the loss of labor rights. We in South Carolina, who do not enjoy the right to organize freely, should demonstrate for genuine labor rights in this state, and the preservation and extension of such rights around the country..
We enthusiastically encourage everyone who can to attend the rally at 1:00 PM, Saturday, March 12 at the South Carolina State House. Please contact the South Carolina Progressive Coalition and help popularize and distribute information about the rally around the state. A press conference was held on March 7 in Greenville, and was covered by WYFF Channel 4 News. Join the emergency call for a moral budget in South Carolina. Our political leaders claim there is no alternative to further cuts to critical state services. We believe there is an immediate and fair alternative through tax reforms. A growing number of religious, community and business groups are calling on politicians to reform the state’s antiquated tax structure. Sales and service tax exemptions left nearly $4 billion out of the state budget last year. 60% of South Carolinians paid no state income tax last year. Facing an $800 million shortfall to maintain bare-bones state services, increasing tax revenue is a moral imperative. To become a sponsor, or for materials to organize in your community, contact the SC Progressive Network at network@scpronet.com, 803-808-3384. Sign the petition for a moral budget at Ties That Bind web site. Download a rally flyer to send to friends, or to post at your workplace, church or business. RSVP on Facebook, and invite your online friends. Read “The Budget As A Moral Document” here. Read the SC Christian Action Council’s statement on the budget here. Download the SC Taxation Realignment Commission Report. Check out Reduce Our Awful Tax Rates (ROAR SC). The South Carolina Senate passed H 3003, the Voter ID bill, sending it to Governor Haley with a straight party line vote. The voter ID bill will cost money, as the state will be required to offer free ID to anyone who cannot afford it. Importantly, the bill will interfere with the ability of voters to exercise their right. 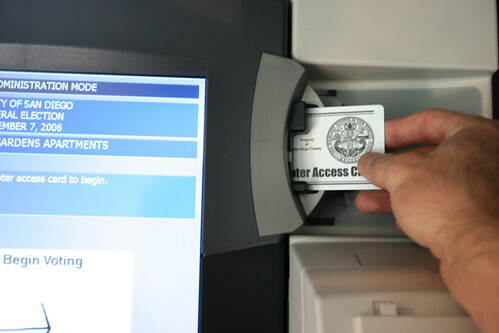 Defenders of voter ID bill claim that they will reduce fraud. However there is no evidence of any organized voter substitution. The requirement for voter picture ID seems more driven by paranoia about who has the vote. It is common to see white self-identified poll watchers in black majority precincts intimidating voters through insistence on current ID requirements. Burdensome photo ID or proof of citizenship requirements for voting could block millions of eligible American voters without addressing any real problem. Although most Americans have government-issued photo ID, studies show that as many as 12% of eligible voters nationwide do not; the percentage is even higher for seniors, people of color, people with disabilities, low-income voters, and students. Many of those citizens find it hard to get such IDs, because the underlying documentation (the ID one needs to get ID) is often difficult to come by. Those difficulties will increase substantially if documentary proof of citizenship is needed to vote or to obtain the identification required to vote. A budget panel initially proposed the money as a one-time cash infusion from a pot of money that funds schools. The vote Wednesday was applauded as not re-directing money that would go to traditional schools, and as a permanent budget line, meaning advocates won’t have to come seeking money again next year. “It doesn’t matter to me where the money comes from as long as we get sustainable funding,” said charter district superintendent Wayne Brazell. The South Carolina Legislature is perfectly capable of spending money when it serves the special interests of the SC GOP. It will not deal with the estimated $200 Million shortfall in the state budget with the same speed. In fact the $25 Million that will go to fund privately operated charter schools will draw on the general revenue that could go to support Medicare in this state. Alexander, Thomas C. Bright, Lee Bryant, Kevin L. Campbell, Paul G., Jr.
Fair, Michael L. Grooms, Lawrence K. Hayes, Robert W., Jr. Knotts, John M., Jr.
Leatherman, Hugh K., Sr. Martin, Larry A. Martin, Shane R. McConnell, Glenn F.
McGill, J. Yancey O’Dell, William H. Peeler, Harvey S., Jr. Rankin, Luke A. Rose, Michael T. Ryberg, W. Greg Setzler, Nikki G. Shoopman, Phillip W.
Malloy, Gerald Nicholson, Floyd Pinckney, Clementa C. Reese, Glenn G.
Scott, John L., Jr. Sheheen, Vincent A. Williams, Kent M.
Democrats Ralph Anderson, J. Yancey McGill, and John W. Matthews, Jr. did not vote. A few weeks ago we published accounts of the open hearing conducted by the Blue Ribbon Commission on America’s Nuclear Future in Augusta, Georgia. The Commission was taking public and industry statements on the proposal to reprocess spent nuclear fuel at the Savannah River site. Today, Matthew McKinzie of the National Resources Defense Council discusses where spent nuclear waste is located around the country. Even without the proposal to use the Savannah River Site for reprocessing and further storage, South Carolina already stores more nuclear waste than any other state, except for Illinois and Pennsylvania. Nuclear power plants receive new nuclear fuel once every 18 months to two years, and about one-third of the reactor core is then removed as spent fuel. This spent fuel is cooled in a storage pool next to the reactor, and either remains in the pool or is transferred to casks licensed by the Nuclear Regulatory Commission for so-called “dry” storage nearby. For the most part, then, all of the spent fuel produced by U.S. nuclear reactors hasn’t left the grounds of the nuclear power plant – in fact a large portion of it remains in the pools. The most recent data we have on the quantities of spent fuel at the U.S. reactors is from the U.S. Energy Information Administration, from 2002, and I have mapped this up in Google Earth here. The total quantity of spent fuel stored at U.S. nuclear reactors in 2002 was 47 thousand tons. An additional 20 tons of spent fuel discharged per year from 104 reactors for 9 years totals 18.7 thousand tons, so our estimate is that the total quantity of spent nuclear fuel currently stored at U.S. reactors exceeds 60 thousand tons. So in terms of where the spent fuel is located, Illinois tops the list, with more than ten percent of the commercial reactor spent fuel in the country. Pennsylvania, South Carolina, Michigan, and New York, Alabama and Florida come next on the list – these seven states together hold more than half of the country’s spent nuclear reactor fuel. And as you can see in Google Earth, many of these spent fuel storage sites are on the shores of the Great Lakes and major rivers like the Mississippi, and along the Pacific and Atlantic coasts – because those waters provide the reactors’ cooling. In absurdist fashion, the new Waste Confidence Rule contains a “predictive” safety “finding” that simply stipulates spent reactor fuel can be disposed of safely at some unspecified time in the future, whenever it becomes “necessary” to dispose of it. The Rule also concludes that for at least sixty years after the cessation of reactor operations, spent fuel can be safely stored at reactor sites or in “special” facilities. Environmental advocates like the National Resources Defense Council and Friends of the Earth want to stop the production of nuclear processing. We aim to require the Government to include the costs and environmental risks of spent fuel disposal within the scope of the licensing review of new nuclear reactors, and weigh the relative costs and benefits of new nuclear reactors against far cheaper energy efficiency savings and new renewable electricity sources. While it may seem that reprocessing offers an alternative to storage at scattered nuclear reactors, the proposal to use the Savannah River Site does nothing to discourage the continued operation of nuclear plants. If the Savannah River Site were to be come a major reprocessing facility, as both Senators Jim DeMint and Lindsey Graham desire, then South Carolina could become a dumping ground for waste far into the future. Wisconsin Green Party member Ben Manski, who was nearly elected as a WI state representative last year, appeared on CNBC last night makes the case for workers, students, consumers, farmers and voters. Manski comes on at about 9 minutes. CNBC will not permit embedding in this format, but here is the link. This page is an excellent resource on the events in Madison. The Wisconsin Green Party is very active in the ongoing demonstrations and there is plenty of breaking local Madison news appearing in the GP’s twitter feed. Photos from around the Madison protests against Gov. 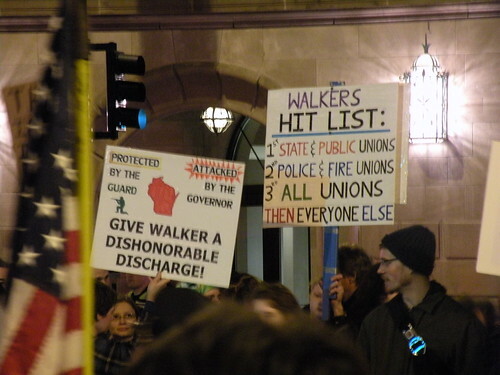 Scott Walker's attempt to bust unions. Flickr photo by Dennis Deering, reproduced under Creative Commons License. Greens denounce austerity budgets, calling them a ploy to balance budgets on the backs of working people, destroy unions, and enlarge the power of corporations. Green solution to deficits and economic recession: rescind tax cuts for the rich, end the wars and reduce military spending, enact Medicare For All and public works programs. We’re proud to be part of the movement to protect and extend the rights of workers in South Carolina and around the world. Coinciding with Eugene Platt’s efforts to draw attention to the failings of SC’s electronic voting machines comes a critical report from the South Carolina League of Women Voters. The LWV found numerous examples of unaccountable overvotes and other alarming discrepancies in the audited returns from Richland County in the November 2010 election. Authors Duncan A. Buell, Eleanor Hare, Frank Heindel and Chip Moore have produced an indictment of the electronic voting system that must be answered by the state. The South Carolina Green Party is formally opposed to unverifiable electronic voting. The South Carolina State Election Commission’s use of the ES&S voting machines is an expensive boondoggle. Electronic Voting. Flickr photo by Nathan Gibbs. Reproduced under Creative Commons License. Baum’s attitude is typical of a self-satisfied politician, and is unworthy of a public servant. South Carolinians deserve better. We hope that other public officials will follow Platt’s lead and other councils will condemn the electronic voting machines and recommend verifiable voting alternatives. Not only are there cases of votes not being counted, in seven precincts there are more votes certified than were in the vote image file.